I first heard about The Selection from my little sisters, who, by this point, have already read the first three books in the series. I've never watched any of the popular reality TV dating shows, but the prospect of reality TV dating show + future dystopia combined into one novel was enough to intrigue me. So, when I heard about the opportunity to review the book through CleverGirls, I signed up right away! The Selection, by Kiera Cass, follows the story of America Singer, born into a society of numbered castes, where the caste you're born into determines your lifestyle and career. Suddenly, however, she is cast as a potential candidate for the prince of the realm to possibly choose as a wife, and now she has the opportunity to change both her life and the lives of her family if she moves to the castle, meets the other contestants for the role of wife-to-the-crown-prince, and manages not to get sent home to early. Joining The Selection means leaving behind the boy who had her heart, but the more she gets to know the crown prince, Maxon, the more she is intrigued by the young man and the kingdom he will rule. My sisters also described the books as rather "scandalous," but said that I probably wouldn't find it "scandalous" because I don't cover my eyes and run out of the room when a couple kisses on tv (you know who you are...). They were right. A couple of kissing scenes do not scandalize me, though they might seem risque to some. Reading local news is possibly more scandalous than this book, in my opinion. I'm fond of giving the heroines in my books unasked-for advice (which they never heed). As a big sister, I'd be telling America, "Don't play games. Don't be coy. Tell him how you honestly feel about him and don't be afraid to ask for his answer." People wouldn't have to guess nearly so much if they would just talk! Enough with the spoilers, though. The Selection is the first in a series, which makes me all the more likely to approve of it, because I prefer series to stand-alone books (it gives me more time to get to know the characters). It's followed by The Elite and The One. 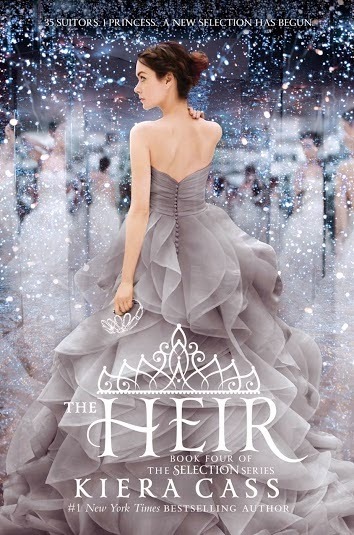 I and my little sisters were all excited to find out that the 4th book in the series, The Heir, will be released on May 5th. That means there should be just enough time for you to get all caught up on the series before the new one comes out, if you start now! I do so hate having to wait forever in between books in a series, don't you? Have you started reading this series yet? This sounds divine! I love the fairytale element with the addition of a modern twist. I already have in mind two girls who will fall in love with this series. Great review! This series sounds really good! I'm always looking for ideas for new books to read, so I am glad you shared this! I read the first one and got really fed up with America's drama and the love triangle, although I did like the world building and the plot. The second one is a lot darker---I liked it more, it explained more of the family dynamics around the Prince, as well as we see America making some choices, finally. Haven't read the third, and had no idea there was going to be a forth. I should read them....maybe. This sounds so interesting! Definitely my type of book! I will definitely be checking it out! Oooh, that sounds interesting and fun! I love princesses and dystopia, so perfect combo. Thanks for sharing this pick! I've heard really great things about this series and have been wanting to get my hands on the books! "Don't play games. Don't be coy. Tell him how you honestly feel about him and don't be afraid to ask for his answer." <- that's really great advice! I haven't heard of this, but it sounds like a story I'd enjoy. And this is shallow, but I love the pretty covers! Oooh! I'll have to read this one! thanks for the awesome review- checking this out!! I hate waiting in between books! I might get into this series someday--it looks like a fun, easy read. I've heard some librarian friends talking about this series lately. They sound like a fun read! I like the premise, but I often find (especially in books like The Hunger Games) that the love triangle annoys me and I want to jump into the book and give the main character relationship advice too . . . Sounds awesome! I'm always looking for a new book series...and I'm a huge fan of "alternate" societies books.....like The Giver? That book rocked my socks off. I am both mystified and terrified of the idea that you're born into certain jobs and lifestyles (spoken like a true American, right!?!?). I've always loved the idea that I can be or do whatever I want, with the right amount of work. Books with classification systems and structures in place intrigue me! Thanks for the review! I hadn't heard about this book until you just wrote about it-- but it sounds great! It sounds like at least an interesting premise! Now I want to read it. I really want to read this series!! Sounds like a fun read--though I wish your review could tell us what happened ;) I do hate it when tv series say "To be continued next week." (In the worse case episode I've seen, it was just when one star is hanging over a bottomless pit with a candle burning the rope holding him up and the other star is tied down with a swinging saw blade coming closer and closer. Producers can be *cruel. *) Fortunately most of the series I watch are episodes posted online from the 50s-90s, so I can just click to the next episode! I've been wanting to read this series for awhile, but I like to wait until all the books in a series are out before I start. I have zero patience. But after reading your post, I'm tempted to pick it up now!